Hear empowering and encouraging stories from creatives, ask questions, and connect with other like minded people from all creative fields. The night will feature a time for networking, an interactive talk with a speaker, followed by a time for Q & A. We will also be intorducing a new format for Conversation Peace moving forward with lots of exciting things to come so dont miss it! The event is free to attend, but please RSVP to reserve your spot. Ed Wilson is a mirror. A born leader, he has lived a life of high achievement not for his own glory, but to model what’s possible for those around him. A standout high school athlete and gifted young wordsmith, Ed invested in a dichotomy of life paths which would weave together a brand which would not only advance his career, but serve his community. The day after graduating college, the accomplished athlete turned scholar went on tour as a spoken word artist. 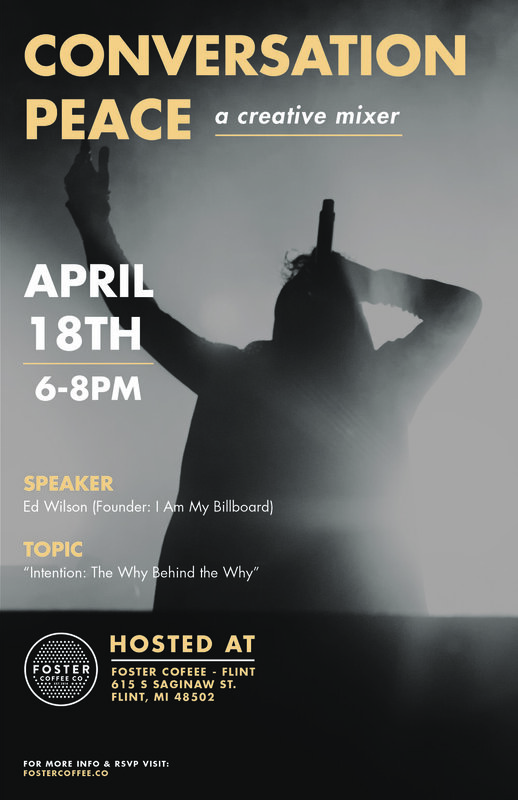 After honing his communication and marketing skills in the classroom, he then shared stages with grammy winners while applying the poetic craft of his youth now focused through the lens of his education. Drawn back to a life of athletics in 2012, Ed didn’t leave his creative life behind him, but integrated his unique and powerful communication style into his vision for personal training. He now owns and operates I Am My Billboard, more an empowerment brand than a gym, where he not only leads people to their fitness goals, but to their inner worth.